Gili Trawangan is the largest and most popular among the three Gili Islands with more cosmopolitan vibe flowing around. With plenty of restaurants, bars and accommodation, it is a favourite hang-out spot for those seeking a place for entertainment. The best way to enjoy the underwater beauty of the Gilis is by snorkel and fin. The waters around the islands are shallow, with abundant coral reefs and regular sightings of sea turtles roaming freely. So, do make sure to indulge yourself snorkeling at Gili Trawangan. - All bookings & tickets are strictly non-transferable/ non-refundable/ non- changeable. - Loss of ticket will be solely under the full responsibility of the passenger. - This voucher is valid on the date of visit as stated. - Passenger name entered in the booking form must be same as per passenger’s passports. Incorrect name may cause penalties or invalidation of travel vouchers. - Please note the activity time can be affected by several factors including weather, equipment maintenance or safety protocols. - Customers are encouraged to bring their own sun protection, swimwear necessity, camera, plastic bag & sandals. - Infants, pregnant women or people who have congenital disease, respiratory diseases, asthma, heart disease and high-blood pressure and experiencing back problems are advised against the activity. The Gili Trawangan Island is among the most sought-after excursion destination in Lombok. Enjoy the view this island above and below the surface of a turquoise sea with white-sand beaches, fringed with palm trees. 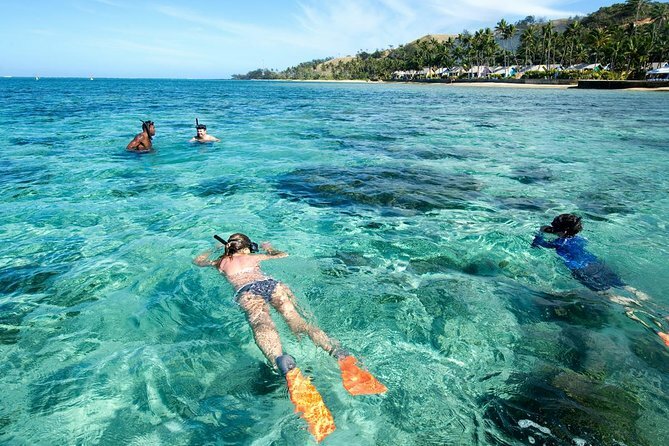 Be thrilled as you will get to see the world below the ocean’s surface by snorkeling or lounge the day away under the palm trees or both! Gili Islands have gained international name and fame for the excellent snorkeling possibilities. Try out indulging in what’s a true paradise particularly for the underwater lovers.